This is just a quick note to let you know that the replay of the free webinar I recorded last week is now available - all you need to do to watch is click the link. I know it says that it's for parents, but that's really not true - any woman who has struggled with emotional eating or binge eating will be able to relate to the content of our discussion and hopefully also gain some new insights around not only why diets don't work, but why they are flat out harmful. 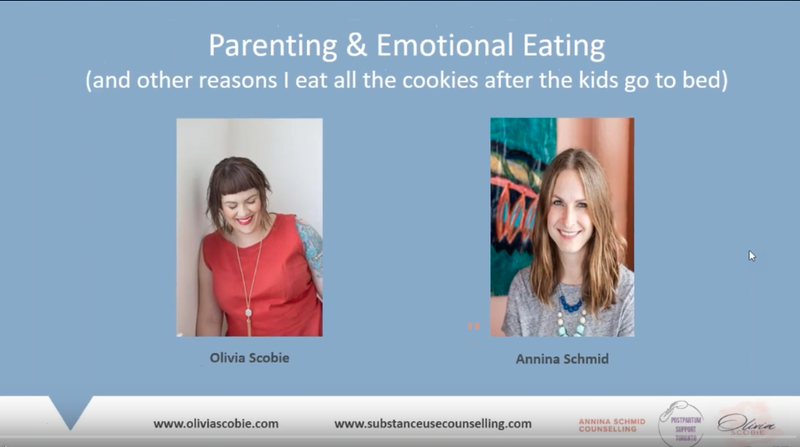 At the beginning, Olivia - whom I would hire as postpartum therapist any day, by the way - talks a little bit about her own traumatic experience with dieting (it literally almost killed her... consider this your trigger warning!). Then, we dive right into the mindfuck that is living in a culture that wants to make money off our fear of being or becoming fat. If you're interested in how Olivia and I approach those subjects, feel free to watch us in action here. And if our talk raises further questions for you, do let me know, I'm always happy to help.